1-877-Appliance can fix most brands and models of Stoves including Maytag, Electrolux, Kenmore, GE, Whirlpool, Thermadore, and more. We repair most oven problems including oven uneven heating, broken heating elements, timers, thermostats, or oven setting control. 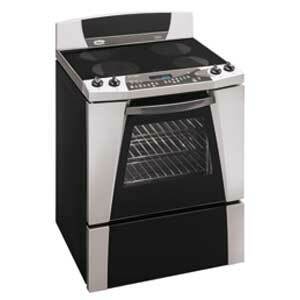 Call 1877appliance for fast, reliable and professional oven repair. Gas and electric stoves operate fairly simply, and they're usually easy to repair, mainly because the components are designed for quick disassembly. Most of the malfunctions that affect gas ranges involve the supply and ignition of gas in the burners and the oven. Most malfunctions that affect electric ranges and ovens involve faulty heating elements. Caution: Before doing any work on a gas range or oven, make sure it's unplugged, or turn off the electric power to the unit by removing a fuse or tripping a circuit breaker at the main entrance panel or at a separate panel. If there is a grounding wire to the range, disconnect it. Also close the gas supply valve to shut off the unit's gas supply. NOTE: It is highly recommended that for any repairs involving a gas oven you should hire a professional.